Here's a game I invented for music nerds (2-4 players probably best, I see it as a friendly 2-player duel). Equipment/Set-up: Each participant has their laptop open with their entire playlist available, keeping every piece of music/song, but removing sound effects, podcasts, and whatever other sound elements you probably have on your machine, but wouldn't consider part of your playlist. Now set each playlist to RANDOM. When it is your turn, skip to the next song and play it, whatever it is. All players listen to the entire song. Then, discuss it. Did others recognize the song? Was it a new discovery? Why do you have that piece of music? What does it mean to you? It's all about sharing the music you love, and perhaps about rediscovering old songs you didn't even realize were on your machine. One done, allow players to note any song they liked so they might aquire it for themselves. Then move on to the next player. Each player starts the game with one card, picked at random, and gets to pick a new card any time another player declares they want to add their song to their playlist (one card, no matter how many players make the declaration). Adjust the number of cards in the pack to taste. You may also want to limit the game further by adding an equal of half number of bogus cards that don't do anything. There are several variants you might consider, like limiting the game to a single song per artists (the way random works, you might get the same albums in rotation), or by tuning your TV to YouTube and playing the song there, on the chance you might have a video to discuss as well. 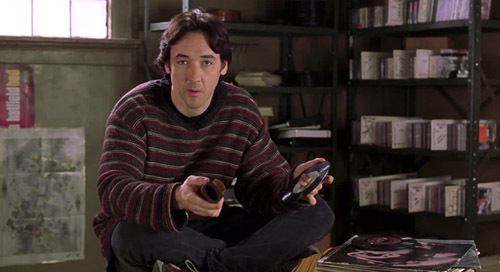 The point is for music nerds to discover new music and share the stuff they love. And what music nerd doesn't want that? I like this! Nice way to work in structured interaction (when too often the interaction of sharing music with others comes down to "let me think about the next song I want to share while your song is playing").